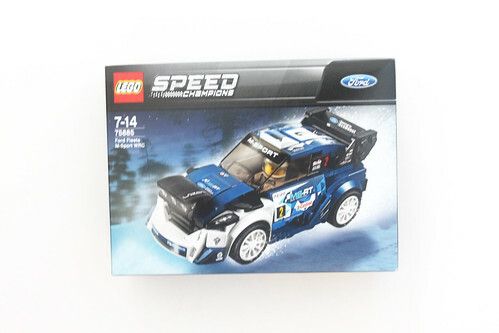 The second 2018 LEGO Speed Champions set that I’ll be taking a look at is the other Ford in the wave, the Ford Fiesta M-Sport WRC (75885). 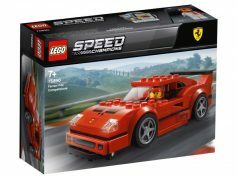 This set has 203 pieces and will probably retail for $14.99 if LEGO follows the pricing model of the single car sets. 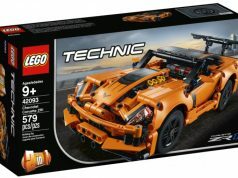 The contents of the box include three unnumbered bags, another bag filled with two sets of white rims, the chassis, the instructions, and a sticker sheet. 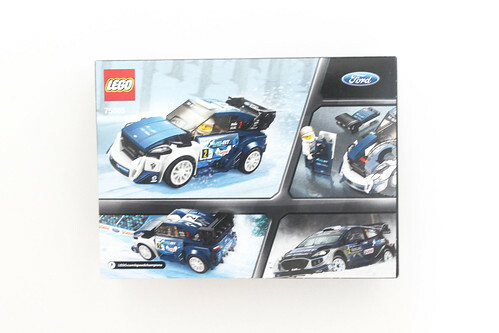 The sticker sheet itself contains a whopping 37 stickers for the Ford Fiesta. 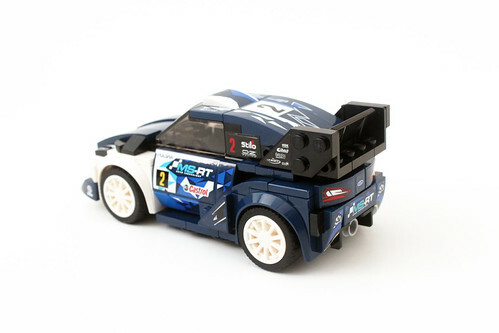 Considering that this is a rally car, it’s not unusual for the cars to be splattered with designs and sponsorships. 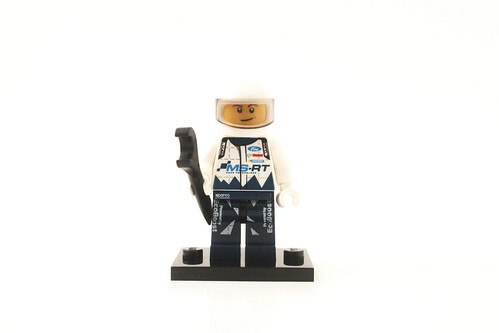 The driver has a really nice looking white and blue racing suit. 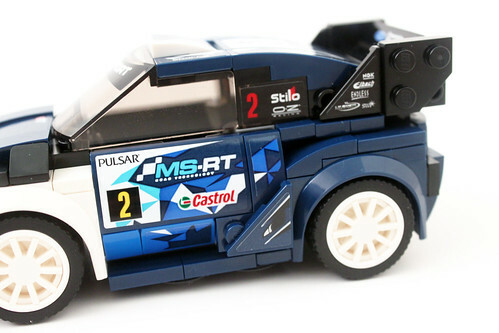 It has details of it showing the Ford MS-RT Road Technology logo across the front of the torso. 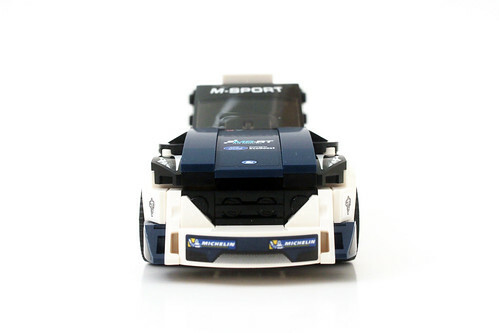 The legs are blue with some white detailing including the Ford EcoBoost printing. 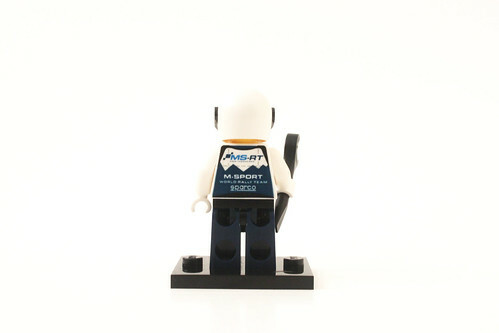 The back of the torso shows the same logo on the upper part of the back while the lower back has the M-Sport World Rally Team as well as a sponsorship for Sparco. 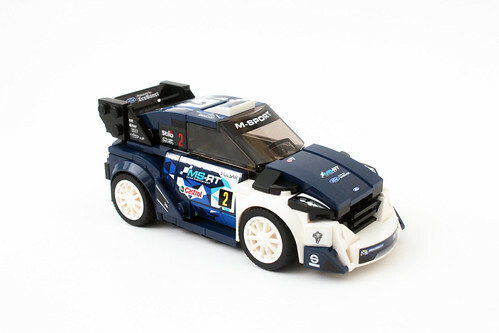 The main color scheme for the Ford Fiesta M-Sport WRC is blue and white with some black. 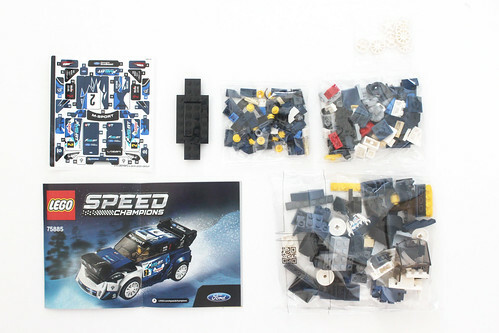 Like with pretty much every Speed Champions set, the build starts off on the chassis and it builds outwards. 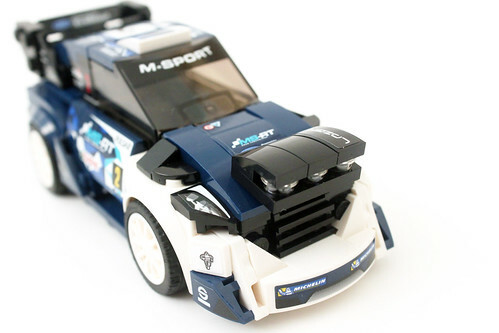 The most interesting thing in the front of the Fiesta is the interchangeable hoods with a normal one as well as one with lights for night racing. 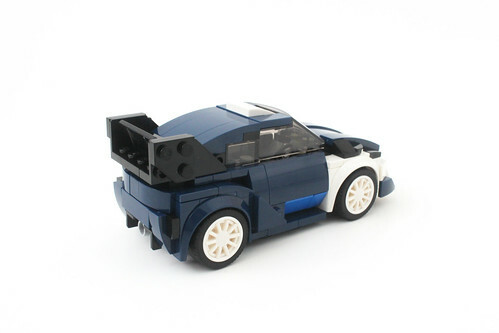 To switch out the hoods, you’ll have to remove the windshield to get to it. 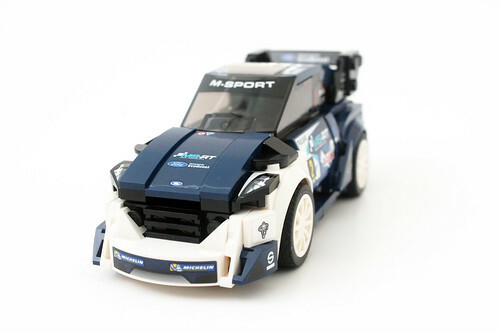 The front of the Fiesta has some cool sponsorship stickers for Lazer on the light hood and some Michelin ones on the front bumper and a couple for the Michelin Man on the front-side bumper area. 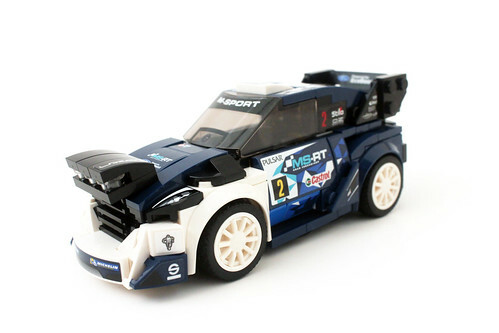 The side profile of the Fiesta looks really good and you’ll notice the slight angle which mimics the design that rally cars have. 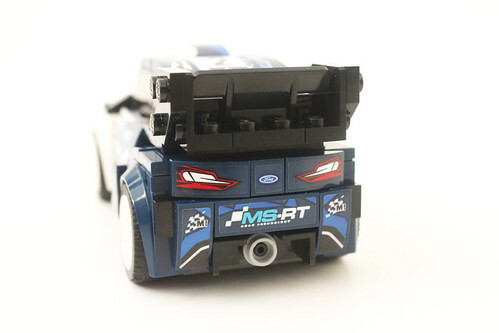 The doors have some larger stickers that fill up the whole door with the Ford MS-RT Road Technology logo as well as the Pulsar branding and Castro sponsorship. Slightly behind the door are some new triangle plates that are decorated with stickers. On the underside of the doors are some new 2×2 plates with two studs which will be useful for builders. 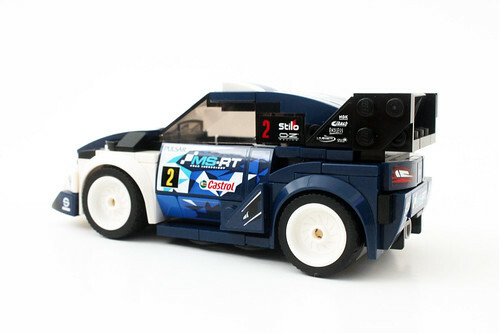 The exhaust makes use of a 1×1 plate with pin and a 1×1 round stud with hole that is reversed. 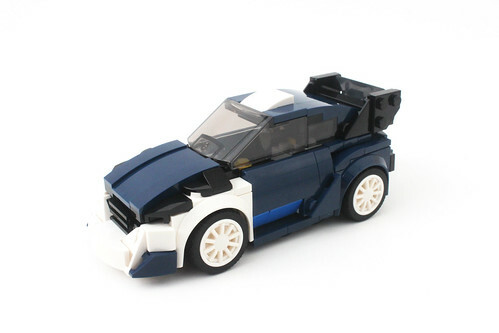 It actually work really well and doesn’t look bad at all. 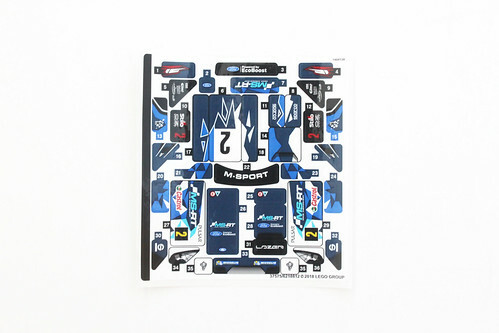 Behind the windshield are more sticker sponsorships such as Stilo, OZ Racing, NGK, Eibach, ENDLESS, L.M. Gianetti, and SWP. 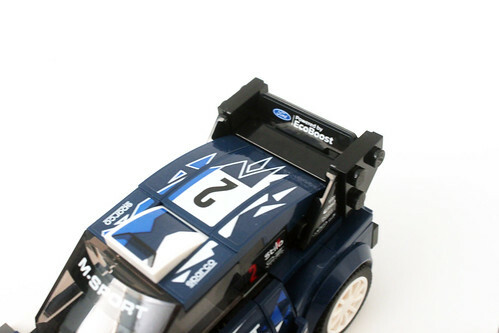 The spoiler also looks very sleek which is flanked on the outside with some new black angled plates and is decorated with the EcoBoost sticker. 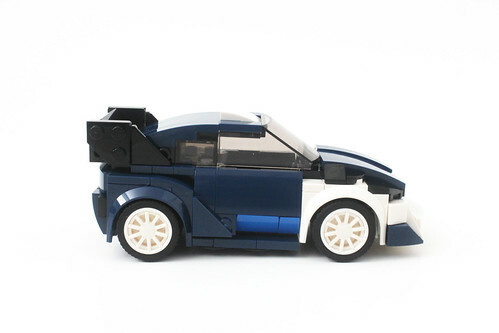 The wheels also pop with the white rims that come in both the five spoke and ten spoke variety. 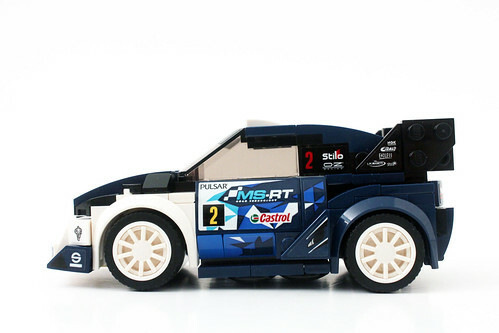 The Fiesta also looks decent without any rims but you do see some of the tan peeking through from the pin. 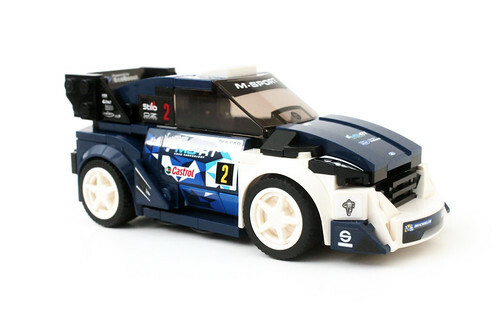 Although stickers are usually frowned upon in LEGO sets, I feel that they are warranted for the LEGO Speed Champions Ford Fiesta WRC (75885). 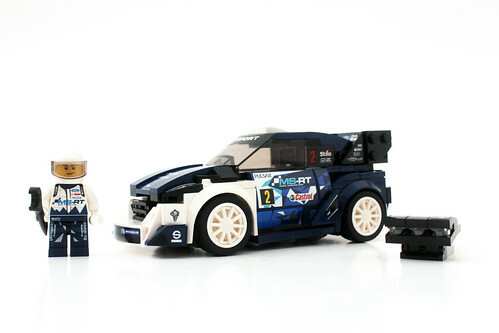 Without them, you still have a nice car but since this one is based on a rally car, you kind of have to have them for it to look the best. 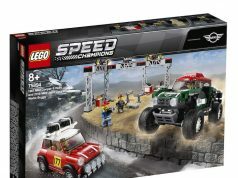 It’s also interesting to see that LEGO included two different hoods for the day and night driving even though they didn’t have to but it adds more realism to the overall look of the set.